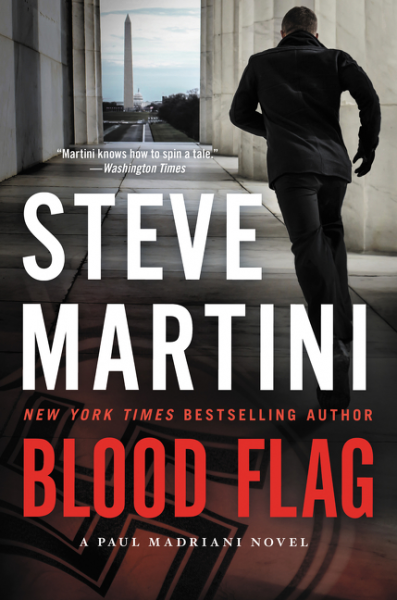 Steve Martini is back with family secrets, Nazi relics and plenty of intrigue in his latest thriller, Blood Flag, published by Harper Collins. It launches today. "No, it wasn't medicine," she says. "It was a small cardboard box. Came in the mail, in brown paper wrapping. Dad said it was something left to him by a friend, a buddy from his army days. I thought it might be jewelry, you know, the size and shape of the box and all. It had Dad's name and address on the wrapper. Inside was a key. It looked like it belonged to a safe deposit box. You know the kind, flat metal with no grooves on the sides." Once the box arrived, her father received phone calls that seemed to scare him. Their house was burglarized. Then he was killed, but all the police can see is Emma killing her father to put him out of his misery and to relieve him of his money. The trail takes Paul and his partner, Henry, back as far as World War II as they try to figure out what could've been so scary about a tiny key and a slip of paper. Paul's assistant goes missing and the intrigue gets deeper and deeper when he realizes that the key leads to the Blood Flag, a sacred relic of Nazi Germany. This is an excellent book to read on a coast to coast airplane trip when you just want to start reading at take off and get lost in another world until the stewardesses force you to move that already uncomfortable seat back up. The historical aspects of the Blood Flag were interesting, and the mystery from World War II kept the pages turning. I enjoyed the character of Emma, in addition to the regulars. This is a great book to take with you on vacation. This book was given to Mystery Playground by the publisher. The review is fair and independent. Wow, sounds like a great book. I am always intrigued by anything related to the Nazi Germany. Love Martini and this is now added to by TBR pile.